Whether you're getting away for the weekend or extending your stay for weeks at a time, this Kingsport Ultra Lite travel trailer will keep you comfortable all along the way. 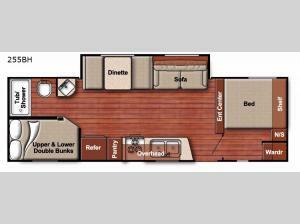 Because this unit can sleep nine people, it is the perfect addition to those who travel with large families or extra guests, and the set of double bunk beds, the booth dinette, the sofa, and the queen-size bed will ensure that everyone has their own place to sleep each night. Rinsing off from a long day in the hot sun will be easy to do in the tub/shower, and finding a snack to curb your hunger until dinner is prepared will also be easy with the 6 cubic foot refrigerator and kitchen pantry.